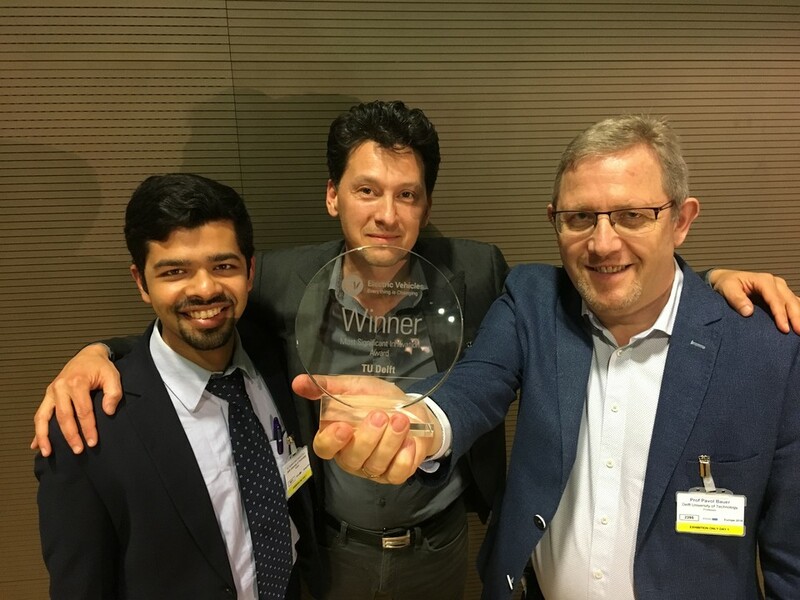 The research from Gautham Ram Chandra Mouli and Pavol Bauer has been awarded with the award “Most Significant Innovation in Electric Vehicles”. Chandra Mouli and Bauer, from the TU Delft, have been awarded the award for a quick charger that can charge cars directly with electricity. ‘This is a real recognition for the research, and a recognition for TKI Urban Energy that financially supported the project’ Mouli says. The charger has been developed together with the companies Power Research Electronics and Last Mile Solutions. In addition to this, the project has been funded by the Dutch Urban Energy Top Consortium (TKI Urban Energy). Therefore, Chandra Mouli developed a more self-evident solution: to use a single converter for both DC and AC. This converter could charge the vehicle via DC while it is also being connected to the AC electricity grid. In the study, which won the award, a 10kW converter has been designed, with an internal DC link and three terminals, which can charge the vehicle both from the solar panels and the electricity grid. The integrated DC charger has a higher efficiency and is about three times smaller than existing solutions based on AC power exchange.’ The use of this charger means that the electricity grid is no longer needed as an interim stage in charging.